Most of the WordPress users never open wp-config file, unless they want to enable multisite feature or debugging while developing. Making minor changes in this file can power up your WordPress site with enhanced performance and improved security. As the name explains, wp-config is the file that lets you configure all the important settings that you require to access your MySQL database. It represents how your site is structured and how it functions. As this file doesn’t exist in the download copy of WordPress, you’re required to create it. In this tutorial, we’ll show you 10 wp-config tweaks that you may not know yet. Let’s go through them one by one. Moving wp-config outside the web root directory is one of the best security practices. Doing so keeps your important information, like your authentication keys and database login details, away from malicious scripts and hackers who can try to access your site’s database using default location of wp-config file. Generally, WordPress looks for wp-config file in its web root. If it’s not available there, then it will automatically look one level above. So, just move this file one folder above the web-root folder. In this way, nobody will be able to access it without SSH or FTP access. If you’re moving your wp-config file, it is recommended to create another wp-config file in the root folder that will point to the “real” wp-config. For a better security, you can also use the .htaccess file to deny public access to it. To do so, put the following code at the top of this file. After moving your wp-config file, you’ll find some other interesting things to do. For instance, you can easily put WordPress itself under version control to keep your WordPress database up-to-date using the git mirror or SVN repository. As your themes, plugins and uploads folders are now inside the SVN or git repository, you may face some problems. So it’s essential to change the wp-content folder’s default location. To move the WordPress content folder, install WordPress in a sub-directory of your web root folder. Then create a new wp-content folder in the web root that have directories for plugins, themes and uploads folders. You can also put these folders separately under version control. WordPress will use this new wp-content folder instead of one that resides in WordPress directory. It means that you can’t access your default themes now. The most efficient solution to this problem is to register the real wp-content folder through register_theme_directory() or move themes to the new wp-content folder manually. To avoid compatibility issues with properly coded plugins, set both the WP_PLUGIN_DIR and WP_PLUGIN_URL constant pointing to the new plugin directory. You can either hardcode the URL of your site or use $_SERVER[‘HTTP_HOST’]. Here WP_PLUGIN_URL is the URL of the location of the directory and WP_PLUGIN_DIR is the path to the location of the wp-config file. Must use plugins, also known as “mu-plugins”, are the plugins that cannot be disable and runs automatically. WordPress automatically looks for “mu-plugins” directory that resides in the WordPress content folder to load these plugins. You can move the Mu-Plugins Directory using the same method we’ve used above for defining WP_PLUGIN_URL. For WordPress 3.6 and above, the default theme is Twenty Thirteen. Changing your default theme to your favorite theme is quite beneficial, if you’re going to create a large WordPress multisite network where you want to use the same theme for all of your sites. Setting your default theme to your preferable theme will help you avoid changing theme for your each site manually. While changing your default theme to another theme, keep in mind that it may remove the safety of falling back on Twenty Thirteen theme when your current theme is not available. In addition, you can also prevent unauthorized users from updating and installing themes and plugins, and updating WordPress via admin panel. Don’t forget to replace ‘your-key’ with your real Akismet key. To prevent your username and passwords from being intercepted, you can secure your wp-login by enabling SSL login on your website. In order to use this great security tweak, you must have SSL support for your website. Set FORCE_SSL_LOGIN to true, if you want to secure logins and prevent passwords from being sent in the clear. Furthermore, the most secure option is to set the FORCE_SSL_ADMIN constant to true. 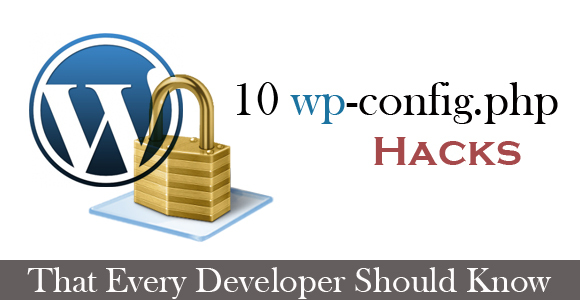 This way all the interaction with your WordPress Backend will occur via a secure connection, as it will secure both logins and admin area by preventing both passwords and cookies from being intercepted. While in development, one of the most common changes that developers make to wp-config file is to enable debugging. It is quite useful while developing or developing to display error messages at the top of the screen, but it should be turned off when your site is live. So it can stop your site from displaying potential errors to the world through which potential hackers can easily access your content directory. You can turn off debugging by setting WP_DEBUG_DISPLAY constant to false. After disabling debugging, you can still see all the error messages in a file called “debug.log” that resides in your content directory (Be sure the WP_DEBUG_LOG is set to true). If you know any other interesting change that can improve a WordPress site, please share that in the comment section given below. Hire Dedicated WordPress Developers on an hourly, full-time or part-time basis to work exclusively on your next project. Get your WordPress site live with our FREE downloadable ebook of over 2500 words. Also receive our latest updates and upcoming exclusive deals. 100% Privacy. We never spam!